If you are a Trade Leader on Collective2 and want to enter your signals into Collective2 by sending us an email, you need to follow a very specific format. This document will explain the format. First, however, we need to stress that email signal entry is not appropriate for everyone. Not all features are available through email. Email allows only the most basic kind of signal entry. 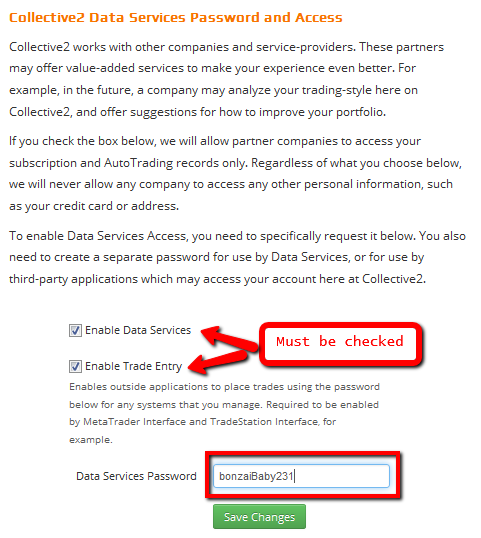 Assuming the limitations above are acceptable to you, here is the way you can use email to enter your trades. Note that uppercase and lowercase do matter. Follow these formats exactly. Only one "trade line" should be in any email (that is, only one trade signal per email). The list above is meant to show you a variety of styles of typing the information; it is not meant to suggest that you can have more than one trade per email. Other notes: capitalization doesn't matter. In many cases the instrument (e.g. stock, option, future) is optional (because we can often figure it out from the format of your symbol)... but it is a good idea to include it in case C2 can't quite figure out what you mean. The @ sign isn't necessary when specifying limits, stops, or market orders (but of course is needed when the symbol, such as @ESH8, requires it). You can include just one of these lines, or both, or neither. That's it. If the order is processable, C2 will enter it into your system. * Huh? What is my C2 Data Services Password? The C2 Data Services Password is a special password you create which allows certain programs or functionality to access some aspects of your C2 account, but not your entire account, and not your personal information or credit card data. You set this password through the YOUR ACCOUNT link, after clicking your name in the upper right corner of any C2 page.